Former Samoan international Zak Feaunati has been chosen to play Jonah Lomu in Clint Eastwood's dramatisation of the 1995 Rugby World Cup. 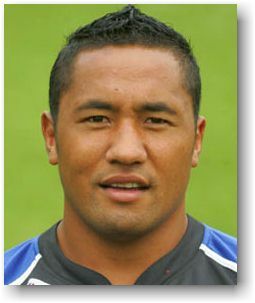 The New Zealand-born Feaunati retired from rugby last year after finishing his career with the Bath club in England. Hollywood legend Eastwood is pushing on with his recollection of the Springboks' famous triumph where they beat the All Blacks in the final. The film, The Human Factor, tells the story of how Nelson Mandela used rugby to unite South Africa. It stars Morgan Freeman as Mandela and Matt Damon as Boks captain Francois Pienaar. Who was going to play All Blacks great Lomu, the undisputed individual star of the tournament, wa….s always a tricky question. At 1.88m and 117kg he has similar stats to Lomu's playing figures of 1.96m and 119kg. Feaunati, a 35-year-old No 8 who played 13 times for Samoa, got the nod after impressing at a casting opportunity in London. "I had to talk about myself for the casting director, and then she asked me to do the haka. I might have scared one or two of the ladies, but I guess it did the trick," Feaunati, now a teacher at a school in the Midlands area of England, told the BBC. He admitted he was stunned at the opportunity. "The first call I got about it was from my old team-mate [Bath prop and Professional Rugby Players' Association chairman] David Barnes, asking me if I wanted to be in a Clint Eastwood film, so I was 99 percent sure it was a prank," said Feaunati. "But when I got a further call from the PRA offices, it dawned on me that maybe this was serious." Feaunati is now head of rugby at Bishop Vesey's Grammar School in Sutton Coldfield. He played for London Irish and Leeds before joining Bath in 2003. He made 131 appearances for the club before retiring last year. Ironically he and Lomu, who has Tongan heritage, were team mates in an International XV in London last year that was organised to benefit British soldiers injured in Iraq and Afghanistan. Eastwood's film is based on the book Playing The Enemy: Nelson Mandela And The Game That Changed The World by journalist John Carlin. While rugby was long seen as the white man's game in a divided country, Mandela urged the black population to support the national team as his country hosted the World Cup. Mandela appeared before kickoff at the final at Ellis Park wearing a Springboks jersey and was introduced to both teams. He eventually got to present the World Cup to Pienaar after the Boks had beaten the All Blacks in extra time with Joel Stransky kicking the winning dropped goal.